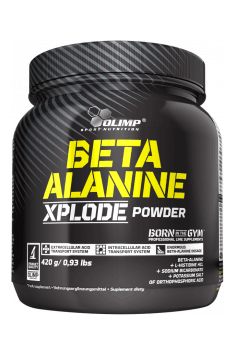 Beta-alanine Xplode™ - This new supplement in the Olimp Xplode™ series merges beta-alanine, creatine and vit. B6 in the Beta-Rush Formula. Moreover Intracellular acid transport system provides potassium salts of orthophosphoric acid and L-histidine and the Extracellular acid transport system gives you confidence that main ingredients will be delivered exactly where they needed, making Beta Alanine Xplode a perfect pre-workout supplement. 1 portion a day. Depending on the body weight the following dosing is recommended: below 70 kg – 1 portion of 3 g, 70-85 kg – 1 portion of 6g, above 85 kg – 1 portion of 9 g, directly before training. Dissolve 1 portion (3g of powder – 5 units = 1/8 scoop) in 80 ml of water. The portion of 6 g and 9 g should be dissolved in 160 ml and 240 ml of water respectively. Drink immediately after preparation. We may expect best effects using beta-alanine every day, also on non-workout days. During the day without training, the portion of 3-6 g should be enough. It is worth to use for at least 6 weeks for satisfying effects. Acidity regulators – malic acid, citric acid; aromas, anti-caking agent – silicon dioxide; sweeteners – acesulfam K, sucralose, cyclamates; colours: beta-carotene, carmine, ryboflavin (for orange flavour), ryboflavin (for lemon flavour), carmine (for red fruit xplosion flavour), E 150d (for cola xplosion flavour).